Mars Hill is trending on Twitter right now. Here are some reactions from a variety of view points. I'm actually sad to hear of Mars Hill's demise. For all the people who now have to go church hopping, people now unemployed, hurt. etc. Redemption Church (Spokane), Agent: Miles Rhode, 10/29/14, Ubi. 603448302 and Bellevue Church, Agent: Matt Rogers, 10/29/14, Ubi. 603448198. Looks like Matt Rogers is getting Bellevue after all. Historically, our mission has always been clear – to make disciples and plant churches. In keeping with that mission you have always been excited about new life and new birth. Last week I shared three values that are the driving goals during this transition period at Mars Hill. Today, I am excited to share with you important decisions recently made about the future of the congregations of Mars Hill Church that we believe will work to accomplish these goals. Please be in prayer for your local elder teams as they contemplate the following options in the next few weeks: (1) becoming an independent, self-governed church; (2) merging with an existing church to create one independent, self-governed church; or (3) disbanding as a church and shepherding current members to find other local church homes. This decision will be made by your local church’s Lead Pastor and elder team. (1) All of Mars Hill’s existing church properties will either be sold, or the loans on the individual properties will be assumed by the independent churches, subject to approval by the lender; (2) all central staff will be compensated for their work, and then released from their employment; (3) if any funds remain after the winding down and satisfaction of Mars Hill business affairs, they will be gifted as seed money to the newly independent churches, then, (4) the existing Mars Hill Church organization will be dissolved. Ultimately, the success of this plan, and the future viability of each of these new local churches rest solely on all of us continuing to be faithful in supporting Jesus’ mission through our attendance and continued giving. Mars Hill Church has never been about a building or even an organization. Mars Hill is a people on mission with Jesus, and that singular focus continues as these newly independent churches are launched. It’s still all about Jesus! Stay with your church family as we embark on a new expression of the same mission. Pray for Jesus to be honored in everything we do as we begin this season of transition. Give generously, as your gifts in November and December of this year will make a critically important difference in our desire for 13 churches being healthy and sustainable from launch-day and thereafter. Thank you so much for your prayers and patience with us as we work out the details of this transition. We are thankful that God has a plan that is bigger than we can imagine and we are thankful that he has always been in control of our future. It has always been his mission, and he still has work for each of us to do–for his glory and our good. Even though this is a remarkable announcement and may lead to some healthy churches, I hope some of the Mars Hill leaders will call out concerns in this announcement. 1. If anything has become clear over the last year, it is that the church was all about buildings and organization. Mars Hill’s Global Fund was all about expanding the Mars Hill brand via new locations and more giving units in the United States. Why now, after all of the changes and revelations, is Dave Bruskas staying within the Mars Hill spin? 2. Why should people continue to give to Mars Hill Church? Shouldn’t the giving now go to the separate entities? In my opinion, any appeal to giving should also include full disclosure of what will happen to the funds. Are the severance packages of departed executives dependent on this continued giving? While the future is getting clearer, the leaders still at Mars Hill should provide an accounting of how funds have been spent in the past. UPDATE: Justin Dean says new churches can’t use Mars Hill name. When Mark Driscoll appeared at Robert Morris’ Gateway Conference on October 20, he told some stories involving harassment of his family. Specifically, he said that rocks had been thrown into his backyard one morning after he and his kids had spent the night in a tent. Then talked about a helicopter flying over head a few days later. Driscoll begins speaking about these matters at 3:20 into the clip. 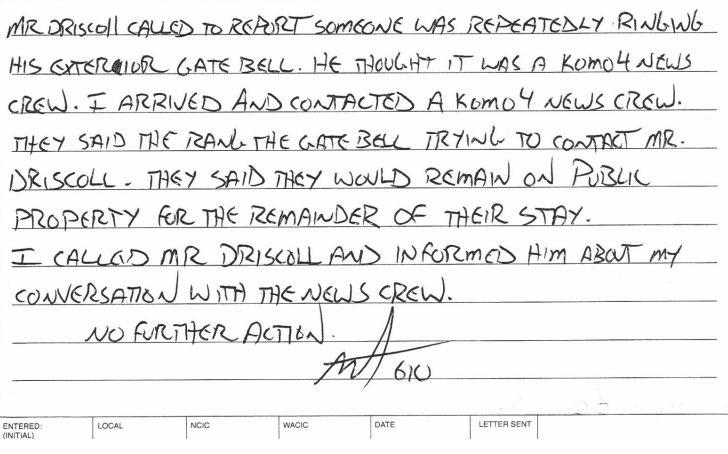 At least one journalist, Dori Monson, initially reported that city officials of Driscoll’s home of Woodway, WA were unaware of any such attack. Although I have yet to hear it, I have been told that Monson has retracted that report. Given the police reports below, he did well to retract. While there is no evidence that the rock throwing report is related to Driscoll’s problems at Mars Hill Church, he did make the incident reports. In order to clarify the record and with thanks to police officials there, I am posting the relevant and appropriately redacted police reports from the city of Woodway. Click the links below. August 28, 2014 – KOMO-TV News effort to get an interview. On the KOMO-TV News report, see this post. 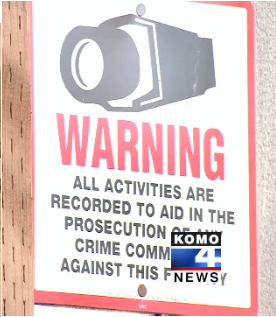 In the KOMO report, there is a shot of a sign on the gate which indicates cameras are recording the activities. The police report includes nothing about a check of any surveillance footage. In an ongoing conversation on a previous post, current Mars Hill pastor Steve Tompkins, indicated that based on the Board of Elders’ investigation, Mark Driscoll is not currently qualified for the office of elder. Speaking to former elder Zack Hubert, Tompkins commented on the findings of the Board of Elders report of their investigation into formal charges by 21 former elders and other private witnesses. To my knowledge, Tompkins is the first current elder who has characterized the Board of Elders investigation as resulting in a finding of disqualification. The only statement from the Board of Elders indicated that Driscoll was asked to enter an elder directed restoration process. However, instead of following the counsel of the elders, Driscoll resigned. The Board of Elders have not released a report, and since the investigation was not completed, there is some question about the existence of a report. There are many unanswered questions about the role of the BoE and BoAA in the manner in which Driscoll left the church. Uncertainty of another kind surrounds Mars Hill Church. Reliable sources tell me dramatic changes are in store for the church. Campus locations are considering merger, independence, or closure. Options for reducing debt and spinning off locations into autonomous churches are being explored. In the future, I might write a formal review of U-Turn: Restoring America to the Strength of its Roots by George Barna and David Barton, but for now I am going to offer some preliminary reactions to it. With a year like that, one would think it would take a public apology and a commitment to change in order to be published again, if ever, as a writer of history. Not so; Barton did none of that. And yet Charisma’s Frontline imprint paired Barton with George Barna to create a past useful for their apocalyptic warning. Values largely reflect our emotional and experiential perspectives. Our beliefs typically stem more from our spirituality. Like values, beliefs play a powerful role in shaping our behavior. Our ideas about the existence, nature, and engagement of God; about the existence of absolute guidelines for right and wrong; about our ability to influence God’s responses to humanity through prayer; and about our sense of eternal destiny—all of these perspectives play a discernible role in how we view ourselves and our world and in the decisions and actions that come to define our lives. As you will see, we are in the midst of a major era of change on the beliefs front, occurring in tandem with the changes related to our shifting values. As you consider the transitions in our beliefs, notice the inescapable interplay between values and beliefs. Their mutual influence means that a change in one necessitates a related change in the other in order for us to minimize our personal cognitive dissonance. Here is an overview of some of the central religious beliefs that characterize the American public today. Barna, George; Barton, David (2014-10-21). U-Turn: Restoring America to the Strength of its Roots (Kindle Locations 643-647). Charisma House. Kindle Edition. As you consider the transitions in our beliefs, notice the inescapable interplay between values and beliefs. Their mutual influence means that a change in one necessitates a related change in the other in order for us to minimize our personal cognitive dissonance. The authors talk about “our beliefs” but then refer to “our personal cognitive dissonance.” Personal dissonance is personal, not collective. The authors strive mightily to create an “American public” straw man to castigate and rail against throughout the rest of the book. Ultimately, the authors want to move “us” back to a set of values that “we” once held. Survey data and history suffer due to this impulse. Early Americans believed that God’s Word applied to every aspect of daily life—a fact documented by any perusal of early sermons. If something important was in the news, then it was also covered from the pulpit with a biblical perspective. Consequently, it is easy to find countless early sermons on numerous topics never covered today, such as earthquakes, fires, droughts, and hurricanes;76 the execution of murderers;77 solar eclipses, the sighting of a comet, or the discovery of a new planet;78 national defense and foreign affairs;79 the duties of civil rulers and of citizens toward government;80 the issues associated with aging;81 immigration;82 education;83 medicine and medical issues;84 economics and taxation;85 and other practical topics. Barna, George; Barton, David (2014-10-21). U-Turn: Restoring America to the Strength of its Roots (Kindle Locations 964-974). Charisma House. Kindle Edition. Has David Barton never listened to the 700 Club? Or his good friend Kenneth Copeland? Those preachers talk about natural disasters, money, politics, etc. all the time. Kenneth Copeland and Barton believe PTSD can be cured with Bible verses. If his historical method was applied now, he would have to conclude that “we” are every bit as devout as the early Americans since examples of sermons about many current events can be located today. Barton does in this book what he does in others. He finds quotes he likes and makes them representative of the view point he wants to support. For his analysis to have doomsday importance, he and Barna need to make the past look like a Christian society and the present look like a departure. In both cases, the reality of the situation is skewed. Steve Tompkins has penned a remarkable open letter in which he calls out past Mars Hill leadership and asks for forgiveness for being complicit with that leadership. You should read the entire letter, but I want to pull out a few segments. Tompkins has some clear words for those who blame outside forces for the problems at Mars Hill. First of all it means that what has been happening at Mars Hill is the work of Jesus in our midst. It means that the root of the problem is not satanic opposition or attack, nor is it social media or vocal online critics, nor is it the members or attenders of the church (past or present). Nor is it elders, deacons, staff and leaders who have called for change from within. In fact the root of the problem has been the leadership of the church who have been blindly committed to maintaining the status quo as if we simply need to push through what has so frequently been referred to as a “difficult season.” All such attempts at crisis management and damage control are futile, foolish, and in fact create more harm since they are the polar opposite of repentance. I am aware that some Mars Hill apologists have blamed outsiders but Tompkins, as an insider, has another view. For example, if the leadership and ministry culture at Mars Hill has been marked by arrogance (and it has), then I am coming to see how I have been marked by that same arrogance, and how I was blind to it, both in others and in myself. I now see how my own sin of arrogance within our arrogant culture therefore went unrecognized and unchallenged. In saying this, I am in no way blaming my sin on others or on the culture. On the contrary, my sin is my own sin which I freely confess. That is what I am now seeing with painful clarity. The same is true with the sin of domineering leadership. In fact, if you mix ministry arrogance together with top-down domineering leadership along with idolatry of church growth and numbers, then inevitably you create a ministry culture where many end up hurt, burned out, feeling used. I see this now, and I see how I helped to build such a culture. This must have been hard to write. In fact, I would say I consider this to be the darkest, most destructive and most hurtful aspect of Mars Hill’s ministry culture by far. I call it the “ad hominem” narrative. Ad hominem is the Latin term for a tactic used when facing off with an opponent over an issue, whereby one seeks to win by attacking and discrediting their opponent rather that honestly debating the issue at hand. In one form or another ad hominem narrative (which can sound very reasonable, especially because it can contain elements of truth), has been consistently used for years to discredit voices of dissent and to silence accusation of wrongdoing and sin. What I have seen on multiple occasions is that when a leader raises an issue with Mars Hill or Mars Hill leadership, they themselves soon become the issue rather than the issue they raised. What they said, for example, is invalidated by how they said it, or because they did not follow proper procedure or protocol. Then, almost inevitably it is not long before they are gone from their position, their job, or the church itself. Often, their integrity was then slandered and their character maligned. Resorting to ad hominem narrative as a response to conflict is horrible and devastating in the extreme. Ad hominem narrative is essentially to defensive one’s own righteousness rather than to trust the righteousness of Another. It never confesses or takes responsibility for sin. It is inconsistent with humility. It resists repentance at any cost. It is therefore antithetical to the gospel. Tompkins has reached out to the elders who were railroaded out of the church in 2007. This includes, for example, the events in 2007 ensuing from the (what I now believe to be the unjust and unfair) firing of pastors Paul Petry and Bent Meyer. I was involved in the subsequent events which included the official investigation process, the trial conducted by the elders, and the official shunning of the Petry family which followed. These events were profoundly devastating and damaging to both the Petry and Meyer families. I deeply regret my actions. I sinned against them through my participation as an elder, and desire to publicly redress these wrongs. I have recently reached out and apologized, repenting to them and seeking the beginning of reconciliation. From them I have received only grace and forgiveness. I am so grateful and humbled. Go read the entire statement here. Turner then made a case to the compensation committee for Driscoll to receive a substantial raise for FY 2013. He also indicated in the memo that he was the only person outside of the compensation committee who knew Driscoll’s salary. d. otherwise have a conflict of interest. Determining the extent of the violation hinges on a definition of “decision making process.” It could be argued that Turner had no part in the decision and therefore did not violate the guidance. I would argue however that recommendation and advocacy to the compensation committee was a conflict of interest for Turner who served at Driscoll’s pleasure. Information gathering is part of the decision making process and should be done by the compensation committee. Turner had intimate knowledge of the process, participated in it, and was the only staff person who knew the facts. If the ECFA guidance permits this kind of participation, then the value of the guidance is again called into question. One could also argue that this memo was written before Mars Hill was accredited. However, did the process continue over the remainder of Driscoll’s time at Mars Hill? If so, it seems to me that the ECFA should at least investigate the role of subordinates in the setting of compensation for FY 2014 and the current year which most likely forms the basis for Driscoll’s severance package. A commenter going by “former mars hill elder” posted a claim that Mars Hill Church would soon declare bankruptcy. I heard yesterday that Mars Hill will for sure be filing bankruptcy. Every church will either close their doors or become independent. Dave is planning on resigning once the transition is complete. Mark will not be receiving his full severance package. The Dave referenced above is Dave Bruskas, lone remaining executive elder at Mars Hill. There is support from the church for the comment that the Mars Hill locations will move toward localized governance. Also, Bruskas has told the church he won’t function in a similar role as Driscoll. The bankruptcy claim caught the attention of commenters on the blog and on Facebook so I felt I should ask Mars Hill about it. We have not and are not planning to file for bankruptcy protection. Mr. Dean is also the same person who said the Global Fund was not a fund, so I am not sure this statement completely clears up the questions. However, I did want the church to have the chance to comment. If others have evidence or want to speak on the record, please let me know. For a long time, Mars Hill Church used non-disclosure and non-disparagement clauses to keep departing staff and pastors quiet about problems at the church. As it turns out, the church might have been violating Evangelical Council for Financial Accountability guidance in yet another way by the used of what former pastor Dave Kraft called a “gag order.” The ECFA provides a template for a church whistleblower policy. If the guidance in this policy (and elsewhere) is observed, whistleblowing should not lead to adverse consequences. However, former employees have described intimidation and threats and so it is clear that the ECFA guidance has not been followed. XYZ Church is committed to the highest possible standards of ethical, moral, and legal conduct. Consistent with this commitment, this policy aims to provide avenues for employees to raise concerns about suspected misconduct, dishonesty, and fraud and to provide reassurance that they will be protected from reprisals or victimization for whistle-blowing in good faith. Employees and any other person who has a concern relating to suspected misconduct, dishonesty or fraud may make a report. The XYZ Church wants to hear of possible problems in these areas. An employee may telephone: (—) — —-. We have retained an independent company to receive calls and descriptions of possible issues. Reports they receive will be forwarded to the Chairman of the Audit Committee. An employee can email directly the Chairman of the Audit Committee at: _________. No pastor, officer, or employee or other person who in good faith reports a violation shall suffer harassment, retaliation or adverse employment consequence. An employee who retaliates against someone who has reported a violation in good faith is subject to discipline up to and including termination of employment. This policy is intended to encourage and enable employees and others to raise concerns within the organization prior to seeking resolution outside the organization. Additionally, no employee shall be adversely affected because they refuse to carry out a directive which, in fact, constitutes corporate fraud, or is a violation of state or federal law. Violations or suspected violations may be submitted on a confidential basis by the complainant or may be submitted anonymously. Reports of violations or suspected violations will be kept confidential to the extent possible, consistent with the need to conduct an adequate investigation. Every effort will be made to protect the complainant’s identity. This policy relates to people on the job. However, all former Mars Hill employees I have spoken with tell me that they never felt safe to press their questions or concerns very far. When Dalton Roraback asked questions about salaries and other financial matters, he was relieved of his position. Where was the ECFA when this happened? The Global Fund bait and switch, Result Source, year end offerings which were actually “hail Mary” offerings to bail out the general fund, using ministry funds to further Mark Driscoll’s book marketing, etc., are all issues that aroused concerns among staff and pastors. Credible complaints relating to an ECFA Standard against member organizations will be investigated thoroughly. Complainants, however, must be aware that ECFA, through its Standards Committee and Board of Directors, interprets ECFA Standards, makes judgments relating to compliance with those standards, and determines a course of action if noncompliance is revealed. ECFA will not take punitive action in cases when it is not warranted. If an organization is not an ECFA member, the ECFA directs the public to the Attorney General’s office. This appears to be a subtle warning to non-member organizations. If you are not a part of the ECFA, complaints should go to the AG’s office. As we have learned complaints to the ECFA don’t go very far. Partly as a consequence of the ECFA inaction and silence, some may now go to the AG in Washington. Joel Connelly, a Seattle Post-Intelligencer columnist, has called on the Washington AG’s office to investigate Mars Hill’s fundraising. At least one person who contacted the AG’s office was told that the office would investigate complaints against the church. I am aware of former members who have filed complaints. In the end, the church may face the same consequences as if it had not been an ECFA member organization. One could make a case that this is fitting since they ECFA has not been transparent about the enforcement of its own standards with Mars Hill.